GA MMA GA MMA Rhover Bonds of the Cross and CresCent — pg. 2 generous alumni donate more than $30,000 — pg. 2 leading the greek Community — pg. 3 spring 2018 initiates— pg. 4 sU N I V E R S I T Y O F O K L A H O M As A L A M B D A C H I A L P H A A L U M N I P U B L I C A T I O N Spring 2018 L ambda Chi Alpha has dominated the intramural championship at the University of Oklahoma for the past 35 years, winning more than 65% of the annual championships. Each year that brought a new trophy, we added it to our intramural wall around the basket- ball court behind the Chapter House. However, the house refurbishment a few years ago removed the wall and it was not recreated. Enter Josh Cardosi, ΓΡ 2710, an active member that held the office of High Rho a couple of years ago. Josh writes that the desire to do a new wall was brought up to him by alumni and actives alike. With the help of Michael Nash, ΓΡ 2253, former High Alpha, and Mom Roberts, the process began. Josh researched the intramural database and old pictures of the previous wall with the help of High Pi Rodger Lalli, ΓΡ 1894. Josh created a GoFundMe account and manned a donation booth at every home football game tailgate over a two-year period to raise the necessary funds. The wall was rebuilt by Norman Fence Company and Lisa Air painted the championship years. Congratulations to Josh for a job well done and thanks from all our alumni. 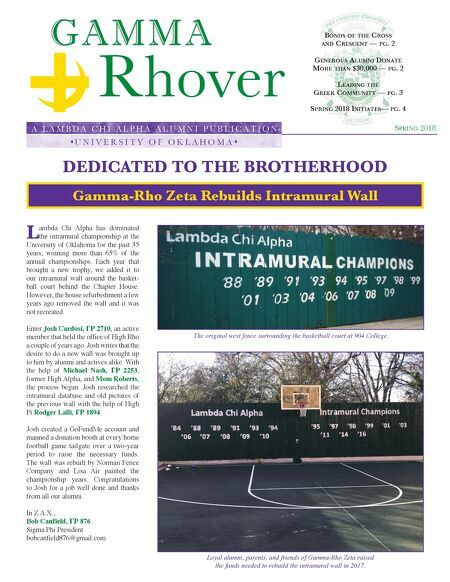 In Z.A.X., Bob Canfield, ΓΡ 876 Sigma Phi President bobcanfield876@gmail.com Gamma-Rho Zeta Rebuilds Intramural Wall DEDICATED TO THE BROTHERHOOD Loyal alumni, parents, and friends of Gamma-Rho Zeta raised the funds needed to rebuild the intramural wall in 2017. The original west fence surrounding the basketball court at 904 College.